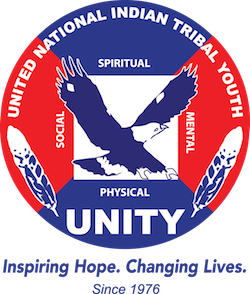 UNITY youth participate in sacred run – UNITY, Inc.
On July 19, 2018, the 27th Annual Mt.Graham Sacred Run kicked off; starting from the San Carlos Apache Reservation and finishing at Mt. Graham. The relay run, started with a night run, consisting of one person traveling along the dirt roads from the Old San Carlos Memorial to the Noline’s gas station in Peridot, Arizona. These individuals would run an “Apache quarter mile” while holding one of five staffs used in the relay run which symbolized the prayers that were being taken to the peak of Mt. Graham. After each person finished their relay, an exchange of the staff to the next runner would take place which ended with a moment to turn clockwise in a full circle as way to continue the prayers that were being carried. The first run ended at midnight with a few hours to rest before the relay continued at Noline’s. With everyone prepped at the days first light at 4:30am, the journey continued for a total of 100 miles in remembrance of ancestors that had made the run in the past and a passage of bringing spirits back to the sacred mountain which ended at a sacred rock where many met to pray and come together through good and bad times. Close to the top of the mountain camp was prepared as everyone helped setup and start preparation for the next coming days. It wasn’t until Saturday that the ascent to the top of Mt. Graham had begun, it was against federal law to go to the very top of the mountain which in previous years those who traveled to the top faced arrest from the forestry service and Graham County Sheriff. At the top of Mt. Graham,people gathered the mountains holy water and prayed for those who couldn’t make the journey this year, it was a time of deep reflection away from the noisy world that allowed each person to hear one another’s stories, share good laughs and enjoy the time together whether it be prepping food or firewood, setting up camp or helping cook, dancing to Apache songs or watching the crown dancers it was truly a special run with great anticipation for the next!